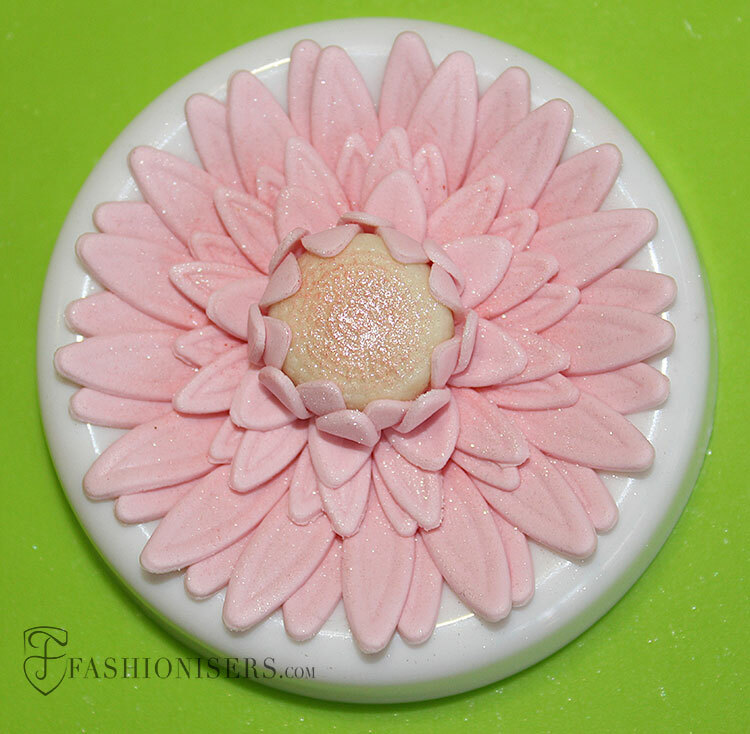 Gumpaste flowers are one of the cutest and most delicate ways of decorating a cake. 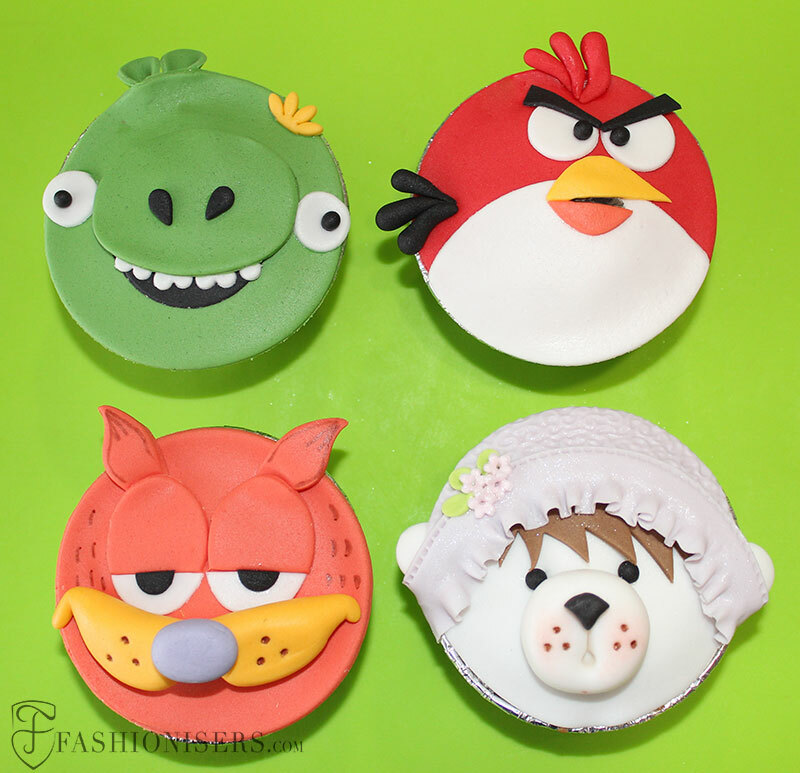 Knowing various techniques of making your favorite flowers from sugarpaste can give you the freedom of creativity to come up with the most lovely cake designs ever. Making gerbera flowers from gumpaste is perhaps the easiest method of adding a bright and fun touch to your special occasion cakes, since very little effort and sugarcraft skills are required even from the beginner to make some. 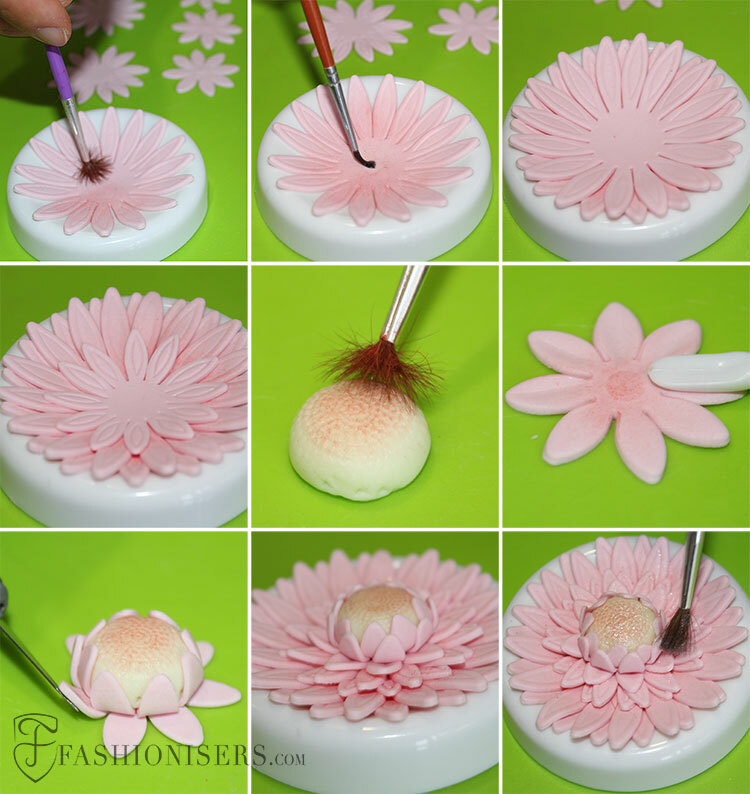 In case you still can’t imagine how to make gerberal flowers from modelling paste, check out our simple gumpaste gerbera flower tutorial and practice to make it perfect! Step 1: Start rolling out the ready colored gumpaste as thinly as possible. In case you don’t have a colored gumpaste, add a few drops of gel food coloring to the white one and knead it well until you get the smooth color. You can pick any colors you like, since gerbera flowers come in various shades, including yellow, orange, pink, red, etc. We have picked a light pastel pink hue for our gerbera flowers. Step 2: Use the largest daisy flower cutter and cut out two large flowers. You need the press the cutter firmly on the gumpaste and then invert it to a clean workingsurface and gently press the embosser down to release the gumpaste flower. The same way, you need to cut two flowers using the medium daisy flower cutter and three small flowers using the smallest cutter. Step 3: Now, take a bit of white gumpaste, knead it well and press it against a small round flower texturizer to get the ideal shape of the flower center. In case you don’t have such a texturizer, you can roll a ball and gently press it against a metal sieve. Dust the texturized surface of the ball with a bit of red powder coloring. Step 4: Place the largest flower on the flower former. Dust it with the same red powder coloring. 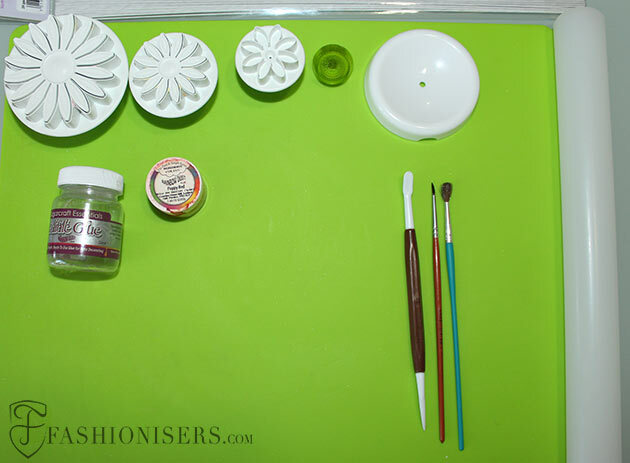 Using the small fine brush, brush the central part of the flower with a tiny amount of gum glue. In case you don’t have gum glue, you can use water instead. Now, place the next big flower on the glued one the way that the petals don’t coincide, but rather cover the free spaces. The same way you need to dust the central part of this flower with red coloring and add a bit of glue, sticking the next two medium flowers, and then one of the smallest one, dusting and adding glue for each one. Step 5: Take two of the remaining smallest flowers and flatten their petals with the leaf shaping modelling tool. Again dust the central part of the flower with a bit of red coloring, add some gum glue and place the flower center on it. 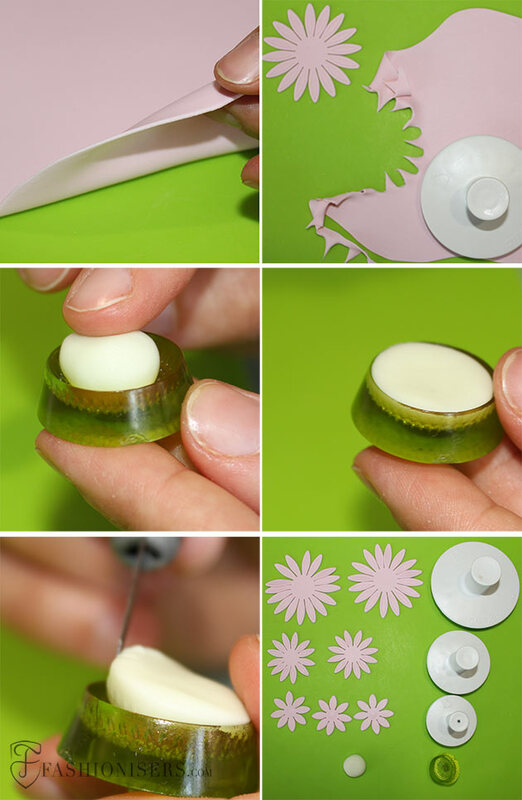 Using a small sharp knife, fold the flower petals covering the edges of the flower center. Next, dust the next small flower, add some glue to it and the same way fold the petals, making sure you cover the free spaces. Step 6: Last but not least, take this flowery ball and stick it to the center of the flower. Dust the ready gerbera flower with some edible glitter and you are done! You can make as many flowers as you like the same way. You need to leave all the gerbera flowers dry overnight or maybe a bit longer, only after which you can use it as a decoration for your cake. Agree that it’s super easy to make your bridal or birthday cake stand out and look more artistic by simply making such gumpaste gerbera flowers!